WhiteHat Security has honed its 17 years of experience in the application security space to provide developers with the tools and services they need to write and deliver the most secure software at the speed of business. The award-winning WhiteHat Application Security Platform, which has been featured on the Gartner Magic Quadrant for Application Security Testing for the last five years, is empowering true DevSecOps by continuously assessing the risk for organizations’ software assets and helping them to embed security throughout–and beyond– the software life cycle (SLC). The company is based in San Jose, California, with regional offices across the U.S. and Europe. For more information on WhiteHat Security, please visit www.whitehatsec.com, and follow us on Twitter, LinkedInand Facebook. APIs are doors into your data and applications, so pausing to include security is just as important as securing web applications. 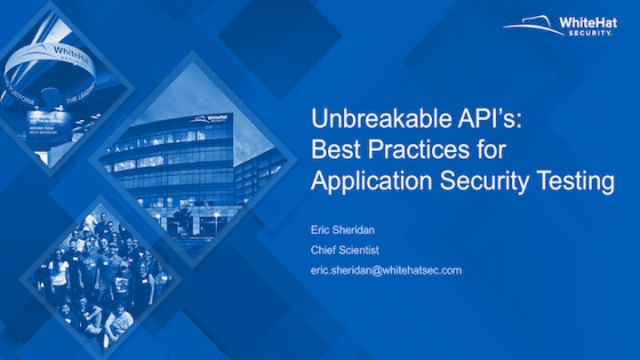 In this presentation we will discuss best practices to ensure that APIs have full security coverage, and how teams can find and fix vulnerabilities before problems arise. For every 100KLOC, a monolithic application will have an average of 39 vulnerabilities whereas a microservice application will have an average of 180 vulnerabilities. You read that right. According to the data gathered from WhiteHat Security’s 2018 Stats Report, the transition of enterprise monolithic applications to distributed microservices architectures is actually increasing the overall average of total vulnerabilities. But why? Why is it that we seemingly continue to make the same mistakes again and again? And what does this say about the security of microservices architectures, or the developers that build them? The journey to a microservices architecture generally involves the decomposition of an already existing monolith application, wherein previous security assumptions and considerations are often questioned and sometimes invalidated. Findings from the 2018 Application Security Statistics Report on the evolution of the secure software lifecycle. WhiteHat partnered with Coalfire and NowSecure to produce the report. Applications are Our Crown Jewels, Will They Ever Be Secure? Applications are our crown jewels. They run our businesses, power grid, military defenses, personal & business banking, social networks, hospitals, and entertainment, and yet are they secure? No, they are most vulnerable, and tend to remain so! In this session, we’ll take a look at data which provides an analysis of tens of thousands of applications from 2017-2018 from approximately 900 companies both enterprise and SMB. The analysis includes global brands and local businesses, hundreds of thousands of application security tests and checks, along with an examination of code and behavior. Joseph Feiman is the chief strategy officer at WhiteHat Security, a leading application security provider. Feiman is responsible for WhiteHat’s overarching business strategy and vision, to further its success in empowering secure development and operations. Previously, Feiman worked for 18 years at Gartner, where he was a Gartner research vice president and fellow. As the Vice President of Product & Corporate Strategy, Setu is responsible for product vision, strategy, and direction at WhiteHat Security. Setu joined the WhiteHat leadership team in early 2016 after a 10+ year stint at TIBCO Software Inc., where he most recently led product management and strategy for the Operational Intelligence product portfolio. From development to DevOps to SecOps, and from day to day management to the Board of Directors, application security analytics are a necessity to drive action across your organization. We’ll discuss a crawl, walk, run approach including basic reporting, vulnerability management, CI/CD integration, and using analytics tools. You’ll learn how to mine your application security data to manage your biggest cybersecurity threat vector. Setu Kulkarni is the VP, Strategy & Business Development for WhiteHat Security. Setu joined the WhiteHat leadership team in early 2016 after a 10+ year stint at TIBCO Software Inc., where he most recently led product management and strategy for the Operational Intelligence product portfolio. During his many years at TIBCO, he led a variety of strategic and operational initiatives – building the SOA platform for the Integration and BPM businesses, building the business launch platform for TIBCO’s cloud business, mainstreaming the LogLogic acquisition, and developing the next-gen ITOA offering. He earned an engineering degree in computer science and engineering from Visvesvaraya Technological University, India. IoT is made up of Microservices and APIs, making them quick to implement and churn out into production. But are they secure? We will look at the challenges a user of the IoT should be aware of, and what checklists can a programmer use for best practices in IoT development. The Rise of Ransomware: Will the Trend Continue? In the past year, we’ve seen a litany of ransomware attacks – Petya, WannaCry, Bad Rabbit and many others. Everything from small businesses to large scale cyber-attacks against large financial and healthcare companies have been impacted. The issue with Ransomware isn’t new. This type of exploit has existed for some time, leaving systems across the world inaccessible with messages that no one wants to see: ‘pay me or else’. Ransomware is an issue but one that can be avoided if companies take the right approach. Will this trend continue in 2018? Join Jessica Marie, Security Evangelist at WhiteHat Security to learn the ways you can protect your organization against ransomware. GDPR is coming and anyone doing business with the EU will need a Data Officer to determine their data strategy. With a third of all attacks coming in against web applications, mapping the data flows through those applications is required to satisfy due diligence in securing your customer data, EU citizen data, and is a good exercise in general to protect your own intellectual property. - Data Classification - how secure does it need to be? - Data Categorization - which regulations will apply? - Data Rules - what kinds of repeatable policies should be applied? Join us to understand what happens when someone logs into a web application. Mike King, Technical Escalations Engineer for WhiteHat Security, will guide you through common access scenarios and vulnerabilities. 2016 saw an all-time high of 4,100+ data breaches and over 4.2 billion records compromised. The bad news is that security attacks and incidents continue piling up in 2017. The good news is that you can take steps to protect your organization from experiencing the same fate of those exploited companies that make front-page news. In this webcast, Ryan O’Leary, Chief Security Research Officer, WhiteHat Security, dissects 2017’s biggest breaches and attacks, highlights lessons learned, and shares proven ways you can shore up your security posture. Register now to hear expert insights on the biggest threats of 2017 and best practices for protecting your organization going forward. Ryan O’Leary is the Chief Security Research Officer of the Threat Research Center and Technical Support at WhiteHat Security. He joined WhiteHat Security as an ethical hacker in 2007 and has since developed a breadth of experience finding and exploiting web application vulnerabilities and configuring automated tools for testing. Ryan manages a team of over 150 security engineers, based in three locations over two continents. He is also responsible for overseeing the delivery of WhiteHat Sentinel, which services over 10,000 customer websites. Under Ryan’s leadership, the team has built a one-of-a-kind database that combines details of more than 26M vulnerability patterns with proprietary algorithms to assess the threat level. SQL injection attacks enable attackers to tamper with, delete or steal sensitive data from corporate databases. In this webinar, Zach Jones, senior manager for static code analysis from WhiteHat Security’s Threat Research Center, will discuss SQL injection attacks and how to best defend against them. WhiteHat Security has extensive experience working with customers to identify and fix the latest web application vulnerabilities. Join us to gain a deeper understanding of common web application vulnerabilities, get expert technical advice on defensive tactics, and learn best practices to safeguard your apps from being exploited.